Pam and Andy Boryea say both corporate clients and individual customers are key to their success. The term ‘visual branding’ translates roughly to depicting a specific design or logo — corporate, academic, political, personal — on everyday objects. 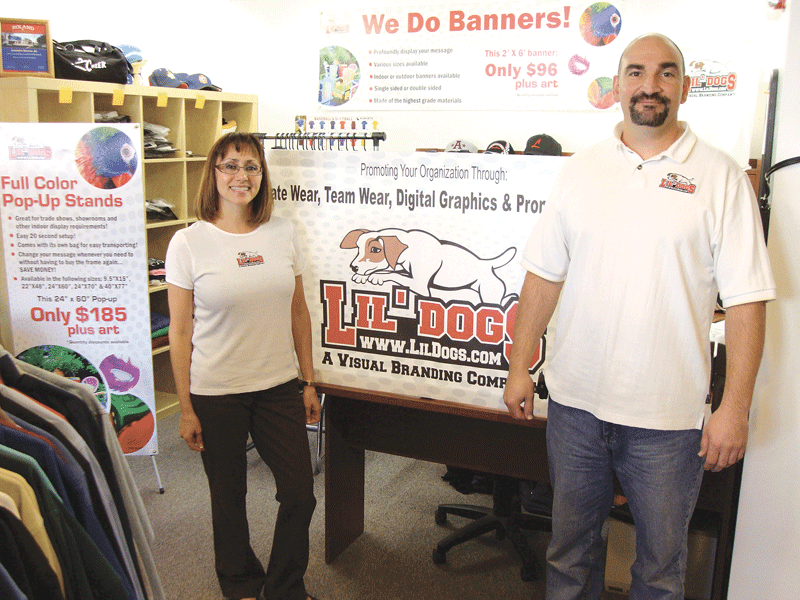 For Andy and Pam Boryea, owners of Lil’ Dogs, the possibilities for what medium that takes knows few bounds. 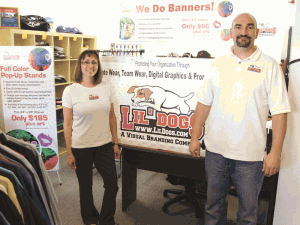 Clothing, banners, those perforated vehicle wraps that one sees commonly on buses, the ubiquitous political lawn placards, as well as the smaller office objects like pens, travel mugs, and many, many other promotional items, all have passed through the shipping dock of the Ludlow-based company. “It’s a one-stop shop,” Andy said. But the origins of the company were a bit more specific. Back in 1997, three friends, all professional soccer players, decided to start a youth soccer camp. Stu MacRury and Glen Jusczyk asked Andy Boryea onboard to provide the goalie for the camp. When Boryea bought into the business, he found that his partners had purchased some used screen-printing equipment. “They thought they were paying too much for the 60 camp T-shirts they ordered,” he told BusinessWest. Deciding to learn more about the process, he jumped in headfirst and went to school for advanced training. And that, he explained, is how the business got its start. MacRury sold his share of the company, and Jusczyk and Boryea decided that the screen-printing facet needed its own name. Jusczyk had recently bought his girlfriend a Jack Russell terrier puppy, and after determining that a toll-free number could be acquired to correspond to the words ‘lil’ dogs,’ their own brand became visualized. Around 2000, the state regulated athletic camps more stringently, requiring medical doctors to sign off on their health plans. Boryea said the cost to do so was prohibitive, and in 2001, they sold the soccer camp and became a full-time print shop. 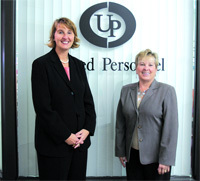 Pam joined the team in 2007, and a year later, husband and wife bought the company outright. What started out as approximately $15,000 in sales in 1998 has grown exponentially each year. Pam said that the year she joined the company, Lil’ Dogs was posting $2.5 million in total sales. There were some acquisitions along the way, she said, citing the purchase that year of Advantage Athletics in Palmer. But the pair credits a good part of the growth to both word-of-mouth and the aggressive sales techniques of their former partner. But as sole owners, the Boryeas said that one doesn’t become a multi-million dollar company as a local screenprinter, so they made the shift toward corporate and academic clients, often doing subcontracted work for some of the most recognizable athletic brands. Pushing their industry further, Pam said that she’s at work launching a Web-based self-created clothing program for customers, offering the ability to design online one T-shirt or many. But still, the pair said that their attention will always be on the customer’s immediate needs. Andy related the story of how Nike contracted Lil’ Dogs to manufacture some transfer designs for the New York Yankees this past season, to be sold and custom processed at their home in the Bronx. Of course, if the Yankees’ postseason was as successful as the work done by Lil’ Dogs, Red Sox fans would be a little less cheerful these days.